I would only take this a bit further (and doing so, make a bit of a stretch). Perhaps Ed can also represent Adam. After all, the Bible describes Christ as the second Adam. 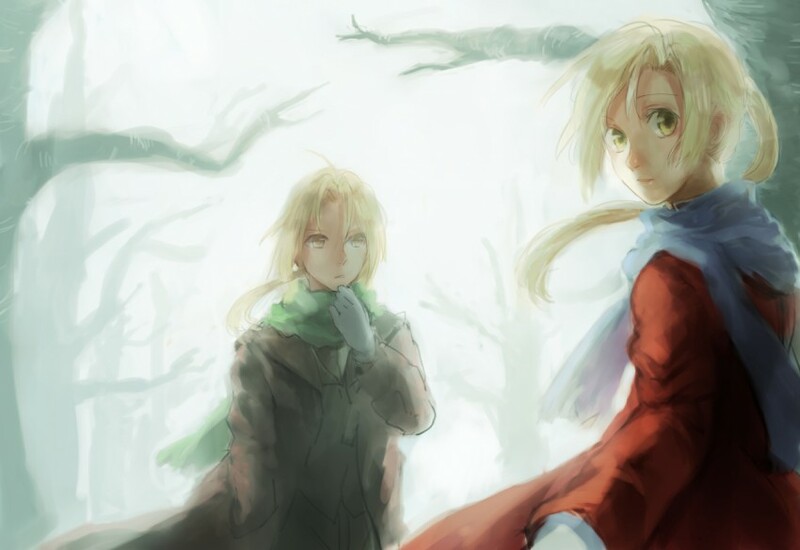 Ed, as the first Adam, along with his brother, Alphonse, commit the “original” sin by trying to be like God. In the Bible, after all, Eve is tempted by the serpent whe he says her eyes will be opened like God’s. The experience they go through, in which parts (or wholes) of their bodies are taken, can be seen as a death. Ed is then reborn – now, he is the second Adam, on the road to bringing salvation for mankind. He also brings salvation for his brother. In Christianity, familial analogies are often used. Christians are sons of the Father, adopted by the Father, daughters and mothers of Christ, and brothers of Christ. As Jesus died for us, his brothers (and sisters), Ed dies for his blood brother, so that he might be saved. The beauty of Jesus’ sacrifice is alive and well, even in non-Christian anime. I never really paid much attention to the religious symbolism in the first FMA anime, at least not until very near the end, but I do have to acknowledge that it was most definitely there. And I completely agree with your Ed-Adam comparison. Thanks for the kind words! I’m glad I stumbled upon that post, because I’d hadn’t seen most of the first series and certainly wasn’t familiar with the part where it departed from the manga. I’ve read much of the manga and watched a large portion of the second series, which doesn’t seem to fit the symbolism quite as well. And here I thought the only relation is the alchemy in the series! The Adam comparison coupled with your explanation was kind of fitting (despite my absolute lack of christian knowledge) and I think I’ve learned sometime new from reading this post xD. Need to keep a lookout for more of such connections everywhere! Haha, yeah, one hope of mine is that my blog will help some who don’t know much about Christianity to gain some knowledge about it. I’m glad you learned something! Oh, I get what you mean man. I keep listening to Christmas songs these days too xD. Oh, DO TELL! Please! Just write, “Spoiler alert!” first. 😛 I wanna read what you think! In any event, I’ve just started watching “FMA: Brotherhood” at the recommendation of those on this blog and elsewhere, and am finding it not altogether to my liking, but am determined to persevere because I feel it’s an important show. The comments here and linked elsewhere have been somewhat of a spoiler for me, but I actually don’t mind at all. It sounds like a very satisfying (if bittersweet) ending may be awaiting me if I persevere. The symbolism may not be nearly as strong for FMA: Brotherhood, since some of the blogger’s comparison has to do with Ed’s sacrifice. Fifty episodes after my first comments, and echoes of the Edward line I referenced above are still ringing. It is just as well that space forces me to be brief, or I’d quote entire sections, thus spoiling rather more than necessary. As if this weren’t enough, just when Roy Mustang had Envy in his power, and was about to give him a well-deserved death, Mustang’s comrades (and at least one former enemy) convince him to stop at the last minute, as the destruction of his own heart would not be worth the revenge. It may not be exactly the same thing as repentance, but it is something like it, and it sure stands out. And best of all, there are still ten more episodes for me to watch as I type. Just finished “FMA: Brotherhood.” My GOODNESS. Why was I so stubborn as to put off seeing this show for so long? No spoilers from me in this post. I couldn’t do a single scene in the last four episodes justice anyway. Suffice it to say that I upped it to a “10” on MyAnimeList, in spite of all the dark disturbing bits. One of the shows on my “to do” list for guest-writing for this blog is the very first anime that seemed to me to have Christian themes hidden in it, “Saint Seiya.” An old-school show that flopped in the US, in spite of making it big in the Romance-language-speaking world, it will always have a special place in my memories in spite of its many flaws. But “FMA” takes all the best themes of “Saint Seiya,” expresses them with (mostly) believable characters, draws them out even further, and brings them to satisfying conclusions. Now I have no choice but to go back to it! My goodness…that would be your only 10 then, right? >…that would be your only 10 then, right? I *think* so. I’d have to go back and check. I might have given the manga version of “Fruits Basket” a 10 — if not, I probably should, as its ending left nothing to be desired that I could think of. I think I may have to make a few other adjustments in my list, as “FMA” is now my new standard to judge all other anime by, unless something better comes along. With really good series, I find, those minor annoyances generally fade away as we become absorbed into the story. Previous Post Anime and Manga Bloggers: I Need Your Help!